eDepartment of Radiodiagnosis (R.R.Y. ), Sanjay Gandhi Postgraduate Institute of Medical Sciences, Lucknow, India. BACKGROUND AND PURPOSE: Hirayama disease is a benign focal amyotrophy of the distal upper limbs involving C7, C8, and T1 segmental myotomes with sparing of the brachioradialis and proximal muscles of the upper limb innervated by C5–6 myotomes. The objective of the present study was to study the utility of MR imaging in young patients presenting with weakness and wasting of the distal upper extremity and to evaluate the importance of the laminodural space during flexion cervical MR imaging. MATERIALS AND METHODS: This was a prospective cross-sectional study conducted from January 2014 to July 2017 in a tertiary care center from Northeast India. 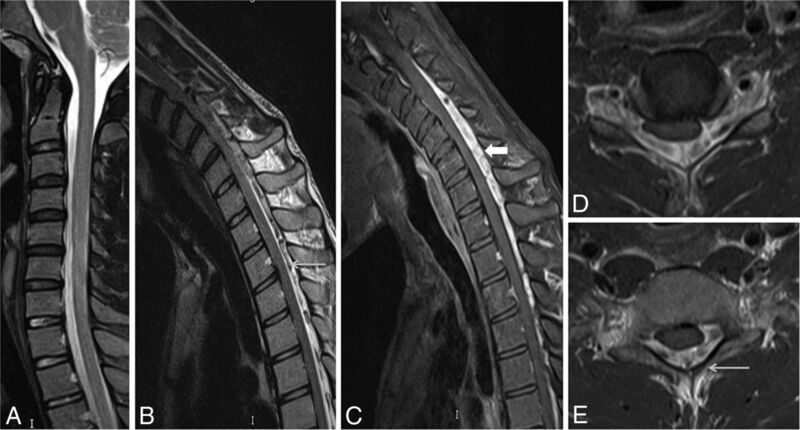 Forty-five patients with clinically definite Hirayama disease underwent electrophysiologic evaluation followed by MR imaging of the cervical spine. RESULTS: The mean age at recruitment was 22.8 ± 5.5 years. Forty patients (88.9%) had unilateral and 5 (11.1%) had bilateral upper extremity involvement. Cervical cord T2-weighted hyperintensities were demonstrated in 16 patients (35.6%), of which 15 (33.3%) had anterior horn cell hyperintensities. Flexion MR imaging showed loss of the posterior dural attachment, forward shifting of the posterior dural sac with postcontrast enhancement, and prominent posterior epidural venous plexus in all patients. The laminodural space at maximum forward shifting of the posterior dural sac ranged from 3 to 9.8 mm, with a mean distance of 5.99 mm (95% confidence interval, 5.42–6.57 mm). CONCLUSIONS: Flexion cervical MR imaging is a very useful investigation in diagnosing Hirayama disease. The increase in the laminodural space and the presence of cervical cord flattening during flexion are essential for diagnosis. Hirayama disease (HD) was initially described by Hirayama et al1 in 1959 in a Japanese patient with unilateral atrophy of the distal upper limb. It was later coined “juvenile muscular atrophy” of distal upper limb extremity2 or “monomelic amyotrophy.”3 HD is characterized by an insidious-onset asymmetric wasting with weakness of the distal muscles of the upper extremity, sparing of the brachioradialis (oblique amyotrophy), and predominant affect on the C8–T1 segmental myotomes.4 Very rarely, atypical HD may affect the lower limbs.5 The disease commonly affects young individuals in their second-to-third decades of life with a predominant age of onset of around 15–25 years.6 Males are more affected than females.6 Initial oblique unilateral amyotrophy more frequently affects the right upper limb than the left, with subsequent contralateral upper limb affection in 50% of cases.3,7 Bilateral symmetric or asymmetric involvement of HD was also reported.8 Lai et al9 noted that forward shifting of the posterior cervical dural sac can occur in healthy subjects also on flexion MR imaging (ranging from 1.0 to 4.2 mm compared with those with HD ranging from 6.1 to 7.8 mm). The aim of the study was to evaluate the utility of MR imaging in young patients presenting with distal upper extremity muscle wasting and weakness and to evaluate the importance of the laminodural space (LDS) during flexion cervical MR imaging. The study was approved by the institutional ethics review committee. Informed and written consent was obtained from all the participants. The study group comprised patients presenting to the departments of radiodiagnosis, neurology, neurosurgery, and medicine in a tertiary care center from January 2014 to July 2017. We included all young adults who presented to the outpatient department with weakness and wasting of the hand and/or forearm muscles with motor axonopathy in nerve-conduction studies. Patients with different etiologies with similar presentations were excluded from the study. Patients with an acute history of trauma, previous cervical spinal fixation or prosthesis, and those diagnosed with ankylosing spondylitis affecting the cervical spine were all excluded. Fifty-six patients with clinically suspected HD were recruited. We excluded 4 due to an inability to achieve adequate neck flexion (3 due to obesity and 1 due to ankylosing spondylitis). Seven patients were excluded due to excessive motion artifacts during flexion MR imaging. Forty-five patients composed the final study group. Motor and sensory nerve conduction studies were performed under standard guidelines. The conduction velocities and compound muscle action potential amplitudes of the median and ulnar nerves were measured for analysis. MR imaging was performed using a 1.5T Magnetom Avanto B15 machine (Siemens, Erlangen, Germany). Image acquisition of the cervical spine was initially performed with patients in a supine neutral position in routine sagittal T2- and T1-weighted spin-echo, sagittal and coronal STIR, and axial T2- and T1-weighted fast spin-echo and axial 2D T2*WI gradient recalled-echo sequences. Sagittal spin-echo T1WI was acquired with a TR/TE of 450–500/9–15 ms; sagittal T2WI, with a TR/TE of 4000–4600/110–120 ms with a 3-mm slice thickness. Axial 2D T2*WI gradient recalled-echo imaging was performed with a TR/TE of 650–750/24–32 ms and a flip angle of 24°–28°. Flexion MR imaging of the cervical spine was performed with a body coil without using a cervical coil. The optimum neck flexion of 30°–40° was obtained after putting soft MR imaging–compatible support behind the nape of neck with further support on either side of the neck to create immobility of the neck during flexion MR imaging. Postgadolinium fat-suppressed sagittal and axial T1-weighted images of the cervical spine were obtained in neck flexion with a slice thickness of 3 mm. MR images were analyzed for cord flattening, cord atrophy, and T2-weighted hyperintensities in the cord or in the region of the anterior horn cells. The maximum forward shifting of the posterior dural sac or LDS was measured in midline on postgadolinium fat-suppressed sagittal T1-weighted imaging on flexion MR imaging. The LDS was measured at the maximum thickness of the dural detachment and enhancing posterior epidural component on postcontrast images. We also obtained the anteroposterior (AP) and transverse (TR) diameters of the cervical cord in axial images both in neutral and flexion MR imaging at the site of maximum forward shifting of the posterior dural sac. The spinal canal diameters were measured both in neutral and flexion sagittal MR images. The AP cervical spinal canal diameter on flexion MR imaging was measured at the site of maximum forward dural shift. The LDS and AP and TR diameters of the cervical cord during neutral and flexion MR imaging were measured in precontrast images and were compared with postgadolinium fat-suppressed images by 2 radiologists. The average value obtained from the 2 authors was compared for any variability using the F test and Pearson correlation. Other MR imaging findings such as cord atrophy and T2-weighted cord hyperintensities were observed by only 1 radiologist. The anteroposterior spinal cord diameters were measured at the midsagittal section from the C2 to T1 vertebral levels. The cord diameter was measured at the midvertebral level of each vertebra. Data were presented as percentage, mean, and SD. Calculations were performed with SPSS programs (IBM, Armonk, New York). Forty-five patients comprised 44 (97.8%) males and 1 (2.2%) female. The age of presentation varied from 14 to 42 years, with a mean age of 22.8 ± 5.5 years. The duration of illness was >2 years in 30 patients (66.7%) and <2 years in 15 patients (33.3%). Forty patients (88.9%) had an affected unilateral upper extremity while 5 patients (11.1%) had bilateral involvement. All 45 patients (100%) had weakness and wasting of the affected hand muscles, 27 patients (60%) had wasting of forearm muscles, and 2 patients (4.4%) had weakness of arm muscles. Thirty patients (66.7%) had cold paresis in the affected hand, 22 patients (48.9%) had hyperaesthesia in the hand, and 23 patients (51.1%) had fasciculations in the affected muscles. Neutral-position cervical MR imaging showed loss of cervical lordosis in 39 patients (86.7%) and localized lower cervical cord atrophy in 27 patients (60%). The cord atrophy was <2 vertebral heights in 19 patients (42.2%), 2–3 vertebral heights in 5 patients (11.1%), and >3 vertebral heights in 3 patients (6.7%). The maximum cord atrophy was observed at the C6 and C7 vertebral levels (Table 1). Asymmetric cervical cord flattening was noted in 31 patients (68.9%) (Figs 1 and 2). Intramedullary cervical cord T2-weighted hyperintensities were noted in 16 patients (35.6%), of whom 8 patients (17.8%) had an involvement of <2 vertebral heights, 6 patients (13.3%) had involvement of 2–3 vertebral heights (Fig 3), and 2 patients (4.4%) had an involvement of >3 vertebral heights. T2-weighted hyperintensities involving the anterior horn cells were noted in 15 patients (33.3%), of whom 11 patients (24.4%) had unilateral affection of the anterior horn cells and 4 patients (8.9%) had bilateral affection. 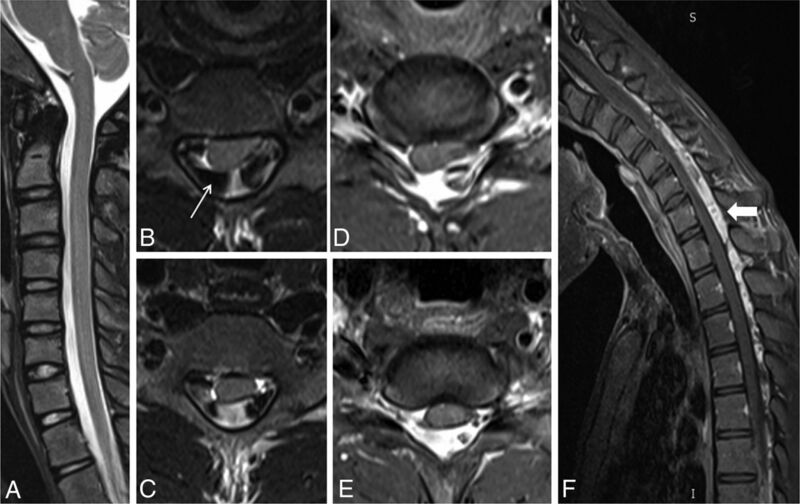 Flexion cervical MR imaging showed loss of the dural attachment, forward shifting of the posterior dural sac, and a postgadolinium fat-suppressed enhancing prominent posterior epidural space in all 45 patients (100%) with HD (Figs 1 and 2). A 22-year-old man with wasting and weakness of the right hand and forearm muscles with cold paresis. Neutral position sagittal T2-weighted MR image (A) shows a normal appearance of the cervical cord. Flexion MR T2-weighted image (B) shows an enlarged posterior epidural space with multiple flow voids (arrow). Postgadolinium fat-suppressed sagittal T1-weighted flexion MR image (C) shows an enhancing epidural venous plexus extending from the C3 to T3 vertebral levels (block arrow). Axial postgadolinium T1 fat-suppressed images (D and E) show the enhancing posterior epidural venous plexus with flow voids within (arrow) and asymmetric flattening of the right hemicord. A 20-year-old male patient with weakness and wasting of the left hand muscles. Neutral position sagittal T2-weighted image (A) shows the normal appearance of the cervical cord. Axial T2-weighted flexion MR images (B and C) and postgadolinium T1 fat-suppressed images (D and E) show widening of the LDS with anterior displacement of the posterior dura and asymmetric cord atrophy, more on the left side, along with multiple flow voids within the posterior epidural space (arrow). Postgadolinium T1 fat-suppressed flexion MR sagittal image (F) shows an enhancing posterior epidural venous plexus extending from the C4 to T4 vertebral level (block arrow). A 21-year-old man with asymmetric wasting of the bilateral hand muscles. Neutral MR T2-weighted sagittal and coronal (A and B) images show lower cervical cord atrophy with segmental hyperintensities in the cervical cord at the C6 and C7 vertebral levels (white arrow). Axial T2-weighted images (C and D) show asymmetric hyperintensities, more pronounced in the left half of the cervical cord (arrow). Flexion cervical MR STIR image (E) shows an enlarged posterior epidural space, which is seen as an enhancing posterior epidural venous plexus on the postgadolinium T1 fat-suppressed sagittal image (F) (block arrow). The measurement of LDS at the maximum forward shifting of the posterior dural sac ranged from 3 to 9.8 mm, with a mean diameter of 5.99 ± 1.90 mm (Table 2). 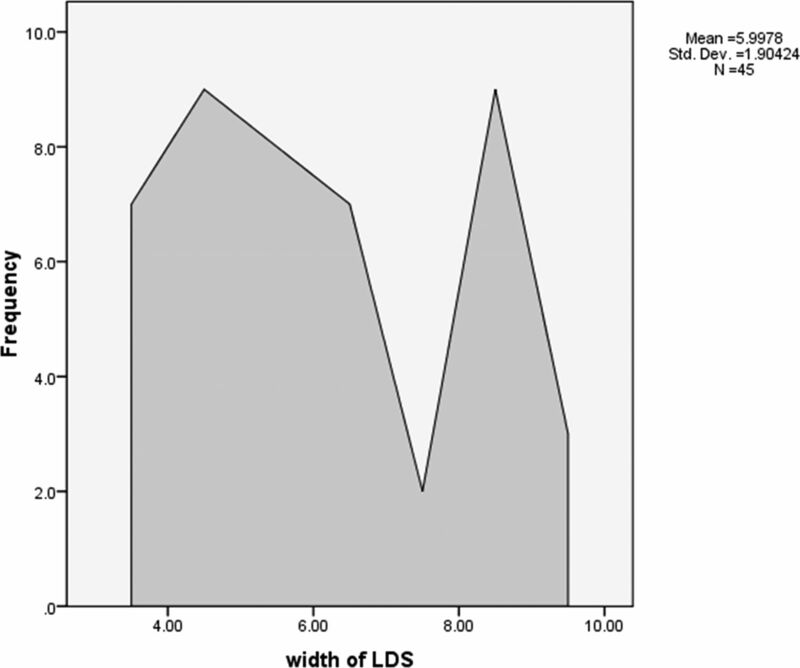 The mean LDS measured by radiologist 1 was 5.97 ± 1.89 mm and by radiologist 2, was 6.02 ± 1.92 mm. The significance between the 2 radiologists while measuring the LDS was an F value of 0.043 and a P value of .886. The correlation between the 2 radiologists while measuring the LDS had a Pearson correlation of 0.989 with a P value of <.001. A scatterplot showing various LDS measurements by the 2 radiologists has been provided in Fig 4. 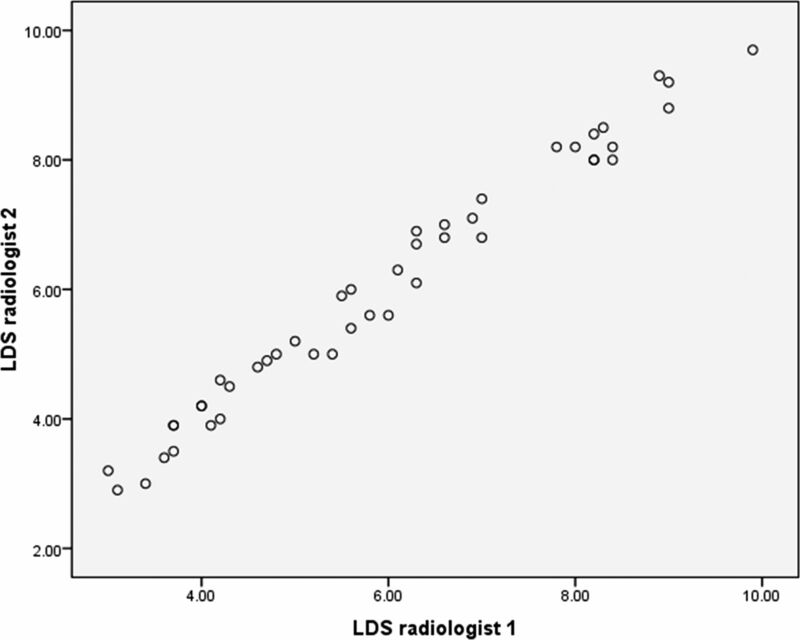 Scatterplot showing the various LDS measurements by the 2 radiologists. Posterior epidural flow voids were noted in 21 patients (46.7%) (Fig 2). The enhancing crescentic posterior epidural space was noted only in the cervical region in 16 patients (35.6%), while 29 patients (64.4%) had involvement of the thoracic spinal posterior epidural space along with the cervical spine (Fig 2). The average spinal canal diameter at the site of maximum thickness of the posterior epidural component during flexion was 12.96 ± 1.01 mm and 12.77 ± 0.99 mm during a neutral position. This finding indicates a slight increment in the AP dimension of the spinal canal during flexion MR imaging. In our study, the average AP diameter of the spinal cord during a neutral position of the neck was 5.54 ± 1.0 mm and 4.82 ± 0.97 mm during flexion. The average TR diameter of the spinal cord during neutral MR imaging was 12.2 ± 1.33 mm and 14.1 ± 1.4 mm during flexion MR imaging. The spinal cord was compressed and anteriorly displaced by the enhancing posterior epidural component during flexion MR imaging, leading to a decrease in the AP diameter and an increase in the TR diameter of the spinal cord at the maximum compression site. The ratio of maximum anteroposterior shifting of the posterior dural sac (ie, LDS)/maximum AP diameter of the spinal canal during flexion MR imaging had an average increment value of 0.46 ± 0.14 mm (range, 0.24–0.74 mm), indicating cord compression during flexion. The ratio of AP diameter of the cord/TR diameter of the cord during neutral MR imaging was 0.45 ± 0.09 mm (range, 0.26–0.72 mm). The ratio of AP diameter of the cord/TR diameter of the cord decreases during flexion because of cord compression and cord flattening. The decrement of the AP/TR cord ratio during flexion was 0.118 ± 0.06 mm (Fig 5). Histogram showing decrement in AP/TR cord diameter ratio during flexion cervical MR imaging in the 45 patients with Hirayama disease. The frequency polygon in Fig 6 shows the LDS measurements of all the cases. There was statistical significance in the LDS measurement for the diagnosis of HD with a P value of <.001. The 95% confidence interval was 5.42–6.57 mm with mean value of 5.99 mm. Frequency polygon showing the laminodural space measurements (in millimeters) during flexion cervical MR imaging in the 45 patients with HD. HD was initially recognized in Japan in 1959 by Hirayama et al1 and was initially reported under the name of juvenile muscular atrophy of unilateral upper extremity. It predominantly affects young adults and adolescents ranging from 15 to 25 years of age. However, it has also been reported in pediatric and old age groups.10,11 The initial symptoms of HD are slowly progressive hand weakness and fatigue, followed by cold paresis, tremors, and atrophy. Asymmetric distribution of symptoms and signs is characteristic, though bilaterally symmetric forms have also been reported recently.8,12 HD may affect C5–C7 segmental myotomes more commonly in Western countries, whereas the C7–T1 segment is predominantly affected in Asian countries.4 Segment C7–T1 involvement was seen in all patients in our study. Repeated or sustained flexion movements of the neck account for necrosis of the anterior horn cells of the lower cervical cord from chronic microcirculatory changes in the anterior spinal artery territory, which is thought to be the etiopathogenesis in HD.13 Another possible underlying cause might be an imbalance in growth between the individual vertebral column and spinal canal contents, which leads to abutment of the anterior spinal cord against the vertebral column and detachment of the posterior dura, leading to a widened LDS, ultimately causing microcirculatory disturbances and ischemic changes in the anterior spinal cord.14⇓⇓–17 Some authors also proposed atopy and elevated serum immunoglobulin E levels as participating factors.18 Tanaka et al19 observed the intrathecal upregulation of proinflammatory T-helper-1 cytokines/chemokines, such as interferon-γ and macrophage inflammatory proteins-1 β chemokine, in the CSF of patients with HD, indicating the possible involvement of intrathecal immunologic processes in this condition. In 2010, Ciceri et al20 proposed that venous congestion in flexion might play an additional role in determining spinal cord ischemic changes. Venous engorgement is thought to be secondary to an impaired venous drainage toward the jugular veins during neck flexion and an increased flow to the posterior internal vertebral venous plexus resulting from the negative pressure in the posterior epidural space because of anterior shifting of the dura. Imaging plays a very important role in the diagnosis of HD. Plain radiographs may only show loss of cervical lordosis, which is a very nonspecific finding. MR imaging is the best technique in the diagnosis of this entity. Conventional neutral position MR imaging may show an atrophied lower cervical cord and asymmetric cervical cord flattening with or without abnormal T2-weighted hyperintensities in the cervical cord, especially the anterior horn cells. More important is MR imaging in neck flexion, which reveals classic findings of posterior dural detachment with forward shifting of the posterior dural sac and loss of attachment between the posterior dural sac and the subjacent lamina, leading to a widened LDS. Postgadolinium flexion MR images demonstrate moderate-to-intense enhancement in the engorged posterior epidural venous plexus, forming a crescent-shaped epidural mass, which exerts a compression effect over the cord with or without flow voids.14,21 Gupta et al22 proposed the use of 3D-CISS for better visualization of the epidural flow voids on MR imaging. Although most existing literature suggests the need for flexion MR imaging in the diagnosis of HD, Lehman et al23 in 2013 reported that neutral MR imaging itself was highly specific with moderately high sensitivity. They also reported that the findings of HD, though subtle, are often present in neutral scans, though the diagnostic confidence may be less. Chen et al15 in 2004 proposed “loss of attachment” from the posterior dural sac and subjacent lamina as the most valuable finding in the diagnosis of HD, reporting a prevalence of 93% in their study group. However, Lai et al9 observed that forward shifting of the posterior dural sac was also seen in healthy subjects in up to 46% of patients, but without spinal cord compression. They further noted that the distance of such a forward shift was mild, ranging from 1.0 to 4.2 mm with a mean of 1 mm, compared with those with HD in whom it ranged from 6.1 to 7.8 mm, with a mean of 6.7 mm. They studied the increment in the ratio of the AP diameter of forward displacement of the posterior dural wall/AP diameter of the spinal canal and the decrement in the ratio of the AP diameter of the spinal cord/TR diameter of the spinal cord. They concluded that the ratio of LDS at the site of maximum forward shift to the spinal canal diameter should be increased in HD with a decreased ratio of the AP/TR diameter of the spinal cord in flexion compared with the neutral position. These ratios do not significantly change in healthy subjects.9 However, the major limitation of their study was the small sample size of 3 patients. We applied the findings to a larger study group. In our study of 45 patients with HD, the ratio of maximum LDS/maximum AP diameter of the spinal canal during flexion MR imaging had an average increment value of 0.46 ± 0.14 mm. The ratio of the AP diameter of the cord/TR diameter of the cord during neutral MR imaging was 0.45 ± 0.09 mm, which decreased during flexion MR imaging because of cord compression and cord flattening. 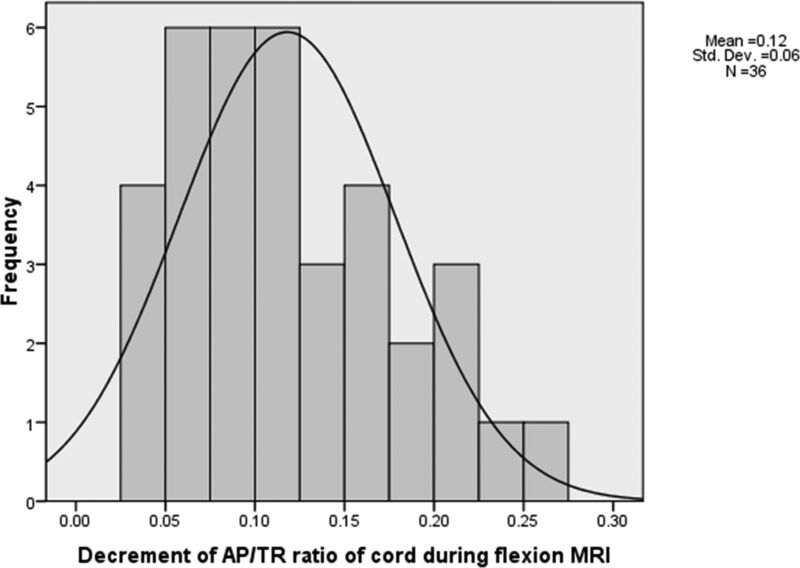 The mean decrement of the AP/TR cord ratio during flexion MR imaging was 0.118 ± 0.06 mm. We acknowledge the limitations in our study. We did not have a control group to compare LDS distance and decide the exact cutoff to label as HD. A uniform angle of neck flexion could not be achieved in all patients due to subject bias. In the future, further case-control studies are necessary to obtain the mean LDS in healthy individuals. HD has a self-limiting course, and treatment is usually conservative. The management includes reducing repeat trauma to the cervical cord by avoiding repeat neck flexion by the use of a soft cervical collar during the progressive stage of the disease process, which is shown to arrest the disease progression.24 Even surgical interventions such as cervical decompression and fusion with or without duraplasty or cervical duraplasty with tenting sutures via laminoplasty without cervical fusion may be advocated in selected patients.25,26 Hence, early recognition of HD is necessary because the patient can be advised to avoid or limit neck flexion movements, which helps in arresting further progression of this disease. So, a high index of clinical suspicion is necessary to diagnose this entity because neutral MR imaging may fail to diagnose it. High clinical suspicion of HD is necessary in young patients with insidious onset of weakness of the hand and forearm muscles with muscle flaccidity. Flexion MR imaging sequences must be obtained to look for LDS widening and anterior displacement of the posterior dura mater because it can be missed on conventional neutral position MR images. The ratio of the LDS at maximum forward shift to the spinal canal diameter is increased in HD with decrement of the AP/TR diameter of the spinal cord during flexion MR imaging. The forward shifting of the posterior cervical dural sac on flexion MR imaging can also be seen in healthy subjects, but associated cord compression, if present, is helpful to clinch the diagnosis. We are thankful to Dr V. Preethish Kumar for his assistance in editing the manuscript. Accepted after revision December 30, 2017.